My delegation and I are delighted to be part of the OECD Eurasia Week which coincides with the 10th anniversary of OECD Eurasia Competitiveness Program. Our heartfelt thanks for the invitation and for the warm hospitality and excellent arrangements. Allow me to focus on Afghanistan’s more recent efforts and achievements as part of our reform agenda with respect to economic development in general and private sector growth in particular. The new Afghanistan Constitution adopted in 2004, not only ushered in a new era of democracy and civil rights, but also laid the ground work for a market economy. Our challenge from the start was to transition from a centralized state-owned economic system to one where the private sector can become the engine of growth, productivity, connectivity, job creation and revenue generation. We also agree that the private sector is a key driver in achieving the SDGs. Since taking office as part of the Unity Government in late 2014, President Ghani and I have prioritized our economic reform agenda which places a special focus on private sector development, improving the business environment and expanding trade, especially exports. The government’s efforts are producing promising results. The World Bank just recently recognized Afghanistan as a top reformer under the Doing Business Report 2019 among 190 world economies, as our ranking jumped from 183 to 167. Thanks to new land and air corridors our exports have increased by 40%, showing more dynamism from our private sector in opening new markets abroad. The economy is growing – and we want the growth rate to further increase in the coming years. However, we still have a long way to go. There is significant room for urgent reform action, especially improving the enabling environment for our micro, small and medium businesses, supporting their ability to meet domestic demand in a more meaningful way while placing greater focus on expanding and diversifying our export baskets and markets. And there is the challenge of fighting corruption and the illicit economy. The private sector in Afghanistan has grown remarkably in size and scope compared with the early 2000s when the private sector structurally did not exist in a major way. It is now time to build on the achievements of the past years and put our focus on the sectors that can have the largest impact in terms of job creation, income generation and production for both domestic demand and foreign markets. To overcome the challenges, the government has already started implementing reforms to improve the business climate, boost private sector development and grow the exports. We are also making sure that women entrepreneurs heads of households can benefit from the reforms and new policies. Furthermore, for the first time ever, the government has created the Private Sector Development Executive Committee (PRISEC) as a high-level interagency mechanism that brings together the private sector, government and our international partners under a single umbrella. Examples of our recent efforts to address the challenges that our business community faces include: Approving and implementing a National Export Strategy, National Trade Policy, reforms for the DBI and the development and implementation of a National Priority Program for Private Sector Development (NPP PSD), 2018-2023. It is worth mentioning that the NPP PSD is demand-driven, time-bound and budgeted. Furthermore, private sector development and business-to-business partnership development have been incorporated into our regional cooperation agenda under the Regional Economic Cooperation Conference on Afghanistan (RECCA) and the Heart of Asia – Istanbul Process (HoA-IP). Through an excellent collaborative effort with the OECD and strong support from the EU, we are boosting the private sector development and entrepreneurship polices in the country, specifically to provide an enabling environment for the growth of the micro, small and medium enterprises. With a new generation of young reform-minded individuals in the government, we have a better opportunity and greater ability to be more effective in delivering on our economic reform promises, creating jobs, generating revenue and becoming more self-reliant. 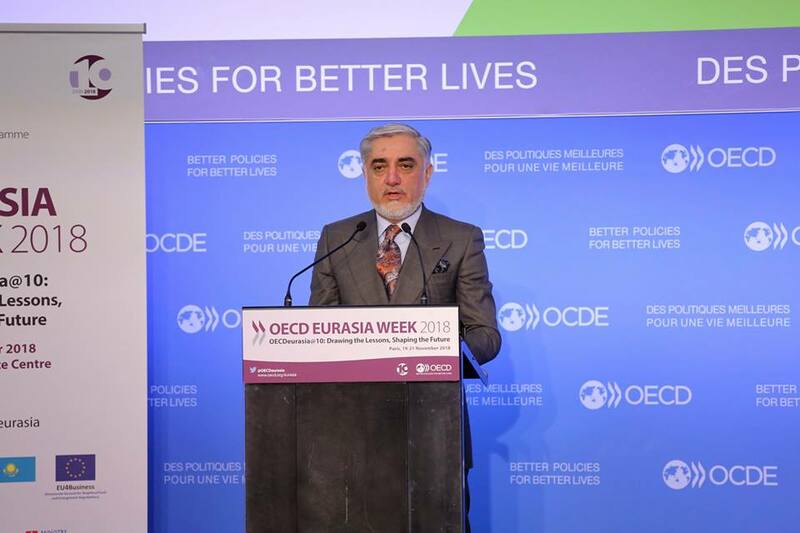 Therefore, on behalf of the government of Afghanistan—and I believe tens of thousands of members of Afghanistan business community—I invite the EU and the OECD to seriously consider and, if possible, commit to a long-term technical partnership as a part of its Eurasia Initiative and other programs that will extend all the way to 2025 or 2030. Structural reforms of the nature recommended usually succeed when a long-term approach and strong political will are given. Finally, as we head soon to the Geneva Ministerial on Afghanistan and review our overall commitments and benchmarks with the donor community, I thank every participant, stakeholders from the business community, the OECD, EU delegation, USAID, IFC/World Bank Group for their contribution and support to this work.